Three and a half years ago I was overweight and out-of-shape (see picture at left) – my 190 pound body was far more comfortable sitting on the couch and watching TV than clicking off miles out on the road. Yesterday, however, after burning off about 25 pounds from my 5’10” frame (the right-hand picture to the left is from last Fall), I qualified to run in the 2011 Boston Marathon by running a 3:15:21 time at the Smuttynose Rockfest Marathon in Hampton, NH. I knew that if I was going to make it, it was going to be close, and I came in with only 38 seconds to spare – the result was a testament to hard work, smart pacing, and the support of my fellow runners both on and off of the course, on-line and in-person. Getting to Boston means a lot to me for a lot of reasons. In fact, the Boston Marathon played a big role in me becoming a runner. I teach at a small college in New Hampshire, and every year our college’s cross-country coach (a colleague of mine) trains a large group of students to run Boston. Most of them are not qualifiers, and for most this represents their first marathon and the longest run of their lives. It’s an immense and inspirational accomplishment, and back in 2007 a few students that I knew well were training to run the race. They both successfully completed the marathon, and that put the bug into my head that maybe I could complete a marathon as well. 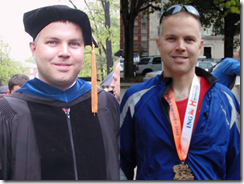 Shortly after our graduation ceremony in May, 2007 (where the “before” picture above was taken), I started to run, and since that moment, I haven’t stopped. Running became a part of me, and I told myself that one day I would run the Boston Marathon. However, I also vowed to myself that I would not do so unless I earned it with a qualifying time – it was a lofty goal, but it kept me moving ever forward, and yesterday I achieved that much coveted BQ. The experience of earning a BQ was an emotional one to be sure, and for this runner, it was truly a dream come true – I will openly admit to shedding a few tears in the car while driving home. More than anything though, it is a testament to the fact that if you want something badly enough, and put in the necessary hard work, you can achieve what once might have seemed an impossibility. Next April, I will stand at the starting line of the 2011 Boston Marathon knowing that it was my own two legs that got me there, and yes, I will probably shed a few more tears. After trying and failing on 5 previous occasions, the feeling of accomplishment is immense, and I couldn’t be happier. Smuttynose Rockfest was my 6th marathon overall. My finish times in the previous five were as follows: May 2008 Vermont City Marathon: 3:43:38; May 2009 Vermont City Marathon: 3:36:12; October 2009 ING Hartford Marathon: 3:32:35; November 2009 Manchester (NH) City Marathon: 3:35:20; January 2010 Disney Marathon: 3:24:49. The first four all involved a major bonk, whereas Disney was a negative split from the first to second half with a very strong finish. The steady downward progression in times should provide encouragement to anyone going for a BQ – it took a lot of hard work, but I’ve cut almost 30 full minutes from my marathon time in the past 2.5 years. My 5K PR of 18:51 (October 2008) and my Half-Marathon PR of 1:29:47 (November 2008) both predict a faster marathon than I have managed, but training volume has always been an issue for me given the demands of job and a family with small kids. For an almost complete listing of my race results, check out my race history on Athlinks. It took me a long time to decide on which marathon I would run this Fall. For awhile I was considering running the Clarence DeMar Marathon in SW New Hampshire, but I kept hearing about this new race on the seacoast that was being billed as the flattest marathon in New England – the Hampton Smuttynose Rockfest Marathon. They run a half marathon every year in Hampton, but this was the first time the marathon had returned to the seacoast in quite some time. A few friends started to sign up for it, so I decided to take the plunge even given my hesitation about it being a new race. Turned out to be a great choice – Smuttynose was a nearly ideal race for my BQ attempt. Although I did manage two separate weeks of about 50 miles, most weeks since last May were under 30 MPW (my son was born in early April). I made up for this somewhat by getting in quality workouts whenever possible, including several hard track interval sessions, and three solid 19-20 mile long runs at relatively easy pace (30-60 seconds above target race pace of 7:28 min/mile). The latter was a bit of a change for me as I have always tried to push on my long runs, despite most resources I have read pointing out that this is unwise and only serves to beat you up and reduce the quality of the rest of your weekly workouts. Running the long runs slowly turned out to be a great approach, and despite the uncertainty that comes along with not running long at near race pace, it seems to have paid off. Quite honestly, I did more slow paced training (>8:00 miles for me) in this cycle than any previous cycle, and it’s an approach I will likely follow again in the build-up to Boston. Another key pair of workouts that I completed in the lead-up to the race were two 10+ mile race-pace runs. Six weeks out I did a simulated half-marathon in about 1:35, which let me know I that I was at least in the ballpark fitness-wise for BQ pace, and the weekend before the marathon I ran 10.5 miles at 7:21 pace as a confidence booster and to keep the feel of race pace fresh in my mind. The latter was a bit of a risk given the proximity to race day, but it felt relatively easy, and it provided a huge psychological boost going into the final taper week (the psychological benefit I gained from this last workout cannot be understated!). I highly recommend a pace test somewhere in the 4-6 week pre-race period, and the simulated half-marathon worked well for me. One last training factor that I think helped on race day was that I ran a significant number of miles in the months before Smuttynose in my Vibram Fivefingers Bikilas, building my long run in them up to 15 miles. The Fivefingers are great for 2 reasons – form work and foot/leg strengthening. By the time marathon week arrived, most of the initial calf soreness that people experience when running in Vibrams or after adjusting their stride to the midfoot/forefoot was gone, and though it’s hard to know for sure, I think the calf and foot strengthening gained from my VFF runs benefitted me greatly on race day, and recovery has been going very well so far. Going into the race I knew that I had a at least one other big thing going for me – I weigh about 7-8 pounds lighter than I did in January, when I ran my previous marathon PR at Disney in 3:24:49. I attribute this mostly to healthier nutrition– not a training factor per se, but perhaps equally important. I also knew that I wouldn’t have to wear the crazy number of layers I ran with in Disney due to the frigid temperatures (see picture to left), which allowed me to run even lighter at Smuttynose. I learned a lot of lessons about how to run a marathon well in Disney, perhaps the most important of which is that smart pacing is critical, and going out too fast is deadly. You can get away with this in a 5K, but blasting out of the gate in a marathon is simply asking for trouble, and should be avoided at all costs. When everyone takes off at the beginning of the race, just let them go – you will catch them later, and passing people left and right in the final 8 miles is a great motivator to keep you moving late in the race. In the final week before the marathon, I opted to taper hard and only ran a total of about 5.5 miles. I was feeling good after my race-pace 10-miler, and thought the rest time would be beneficial. I decided to get a room in Hampton the night before the race (thanks to my amazingly supportive wife for taking on three kids for 24 hours in order for me to do so!). Fortunately, I wasn’t alone in heading to Hampton early, and I met up with my friend Alett (@petfxr on Twitter) and her husband Hugh for an obligatory pasta dinner. We talked mostly about running (of course! ), and Hugh gave me the helpful piece of advice that sometimes everything just clicks when you least expect it, and you find yourself running a race faster than you could have ever imagined possible (he’s a sub-3:00 marathoner). This was exactly what wound up happening for me the next morning. After dinner they gave me a tour of the course, which gave me additional encouragement since it was one of the flattest I had ever seen (max elevation was 90 feet above sea-level – see my Garmin-recorded elevation profile below). There were a few ups and downs, but nothing at all steep, and a slightly rolling course suits my style perfectly. The Smuttynose course is fantastic, and the there is a 4-5 mile stretch along the ocean that is simply breathtaking (you hit it twice as the course is a double-loop). Much of the course runs through scenic neighborhoods north of Hampton Beach, and some of the houses (mansions, really) we ran by were absolutely amazing. Word is out that 29% of the marathoners at Smuttynose qualified for Boston, making it one of the top BQ courses by percentage in the country – I highly recommend it if you are planning a BQ attempt next Fall. I returned to my room that evening only to discover that I had no internet access (the horror!). This turned out to be a blessing in disguise as in the absence of the internet, dailymile, and Twitter, I opted to play Angry Birds on the iPad until my eyes began to glaze over. It was a nice distraction from thinking about running. I decided to have a pre-bedtime bagel with cream cheese to top of my carb stores, drank a bunch of water, and went to bed early (8 hours of pre-race sleep was key!). I woke up on race morning about 3 hours before the start so that I could eat and hydrate completely and let my food digest a bit before the race started. In addition to the lack of internet access, my room also had no coffee maker, but thankfully Alett had supplied me the night before with a packet of Starbucks instant coffee – it was a lifesaver! I generally prefer to not drink anything during the hour before the race in order to avoid an in-race pit stop, and this strategy worked out well in Hampton. A group of friends from dailymile and Twitter had arranged a pre-race meetup, and I walked down to the meeting spot on what turned out to be an ideal morning weather-wise (high 40’s and sunny at race start). I had a blast meeting people that I have come to know well in the on-line running community (that’s me in the brown sweatshirt in the front row of the picture below). Knowing that many of these folks would be waiting for me at the finish was a huge motivator to get the BQ done, and their support was immensely appreciated! I had made plans in advance to start the race with my dailymile friends Brendan and Matt (see picture below) as we were all shooting for a BQ, though mine would require a 5-minute faster time than theirs. Unfortunately, after splitting up for final preparations a bit before the race started, I couldn’t find them in the starting corral (turns out I was in the front and they were in the back), so I had to be content with going it alone (I did line up next to another dailymile friend, Ernesto, but he’s a speedster and was doing the half and would be blazing off ahead of me at sub-7:00 pace). Before I break down the race, let’s talk a bit about gear. I’ve had several people ask me about my shoe choice for Smuttynose – I opted to go with the Saucony Kinvara, as did Matt (of the Run Luau Run blog) and Brendan (mine are the feet in the middle of the picture below). My reasoning was that it’s a light shoe with a low heel (4mm drop), but provides some cushioning. My hope was that the added cushioning would be beneficial in the event of a form breakdown late in the race. I believe that one mark of a good marathon shoe is that you don’t notice it while running the race, and that was exactly my Kinvara experience. No blisters, no hot spots, and felt very comfortable the entire way. Furthermore, it let me keep good midfoot form when I was conscious of it (late race is a bit hazy as I was on autopilot). As for other gear, I went with my Injinji Socks (great for toe-blister protection), Zensah calf sleeves (I’m a compression convert! ), Nike Pro-Core compression shorts, Target running shorts (love the super-cheap C9 gear!!! ), a Brooks Podium tee-shirt, Recofit Arm Sleeves (for wind protection – liked them a lot), and my trusty Garmin with a heart-rate monitor. For fueling, I filled a 5 oz Hydrapak Soft Flask with four GU’s and topped off with water, and a filled cheapo travel shampoo bottle with another 3 GU Roctanes plus water. 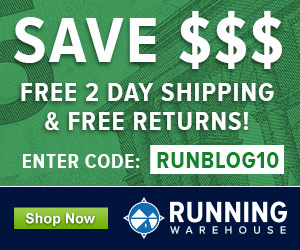 I find that watering down my gels makes them more palatable on the run, and I can sip small amounts regularly as opposed to sucking down the thick paste all at once. I hand-carried the Soft Flask (these things are great!) and sipped about once every mile, then swapped that out for the second flask (carried in a very small Amphipod waist pouch) when the first was empty. It was a risky move going with the GU as I have never used it before, but it worked fine despite the fact that my concoctions tasted like cough syrup (I am not a fan of the Vanilla-Orange GU Roctane, or anything Vanilla-Orange flavored for that matter). I’ll likely be going back to my preferred Carb Boom! in the future, or give Hammer Gel a try. Now back to the starting corral! I took off at the starting gun with only one thought running through my head – slow down! I have a tendency to go out way too fast, and I’m pretty sure that this bad habit had contributed mightily to my late-race demise in several of my previous marathons. I kept a close eye on my Garmin, trying hard to keep the pace right around 7:30 min/mile, and fought hard against the urge to give chase to the masses of runners passing by me (quite a few of whom I likely passed later from mile 15 onward). If there is one thing I have learned as a marathoner, it’s that at least for me, smart pacing is critical. If you go out too fast, you burn your energy stores early in the race and have nothing left when it really counts. Hitting the wall is a miserable experience, and it’s one that I know all too well. For the first 13.1 miles, my sole goals were to run smoothly, stay aerobic by keeping my heart rate between 155-165 bpm, and maintain good running form. I ran for awhile with the 7:30 min/mile Half-Marathon pace group (there were no full marathon pacers as there were only about 500 marathoners total), and was feeling surprisingly good. In fact, the first 13.1 felt almost effortless, and after the midway split where the marathoners left the half-marathoners for the second loop, several of the runners who were continuing on seemed to feel the same way. It really is a perfect, and very scenic, course for a marathon (satellite course view below). Here are my splits for the first 13 miles: 7:33, 7:31, 7:28, 7:23, 7:17, 7:23, 7:15, 7:15, 7:11, 7:21 7:27, 7:26, 7:28. I finished the first 13.1 in 1:36:46, which gave me just over a minute of banked wiggle room for the second half. For the second half of the race I ran mostly with a runner named Jeff who was doing his first marathon. We were both feeling really good, and hung together until just after mile 19 when he developed a side-stitch and started to fall back a bit. We were great at keeping each other in check when we started to push the pace a bit too much, but it was incredibly helpful to run through what are typically the toughest miles of the marathon with someone else with a similar attitude. We had fun picking off runners up ahead of us, and to be honest, I was hoping we would finish off the race together. However, it’s difficult to predict what will happen in the late miles, and despite his cramp, Jeff still wound up pulling out a very respectable 3:18. In a bit of a twist, I found out later in the day that Jeff is actually another friend of mine on dailymile, but neither of us knew it while running the race! As the race progressed, I kept up with my gel sips pretty consistently, and hydrated as much as possible at water stops. If I have one complaint about Smuttynose it was that the water stops were too few and far between -hopefully this will be addressed in future years (I and several others have already emailed them about this and have been assured that this will be addressed). I never felt dehydrated, but the GU got progressively hard to stomach late in the race, and a bit more water and/or Gatorade would have been helpful. One point I’d like to address briefly is my running form. As I have documented here on the blog, I spent much of this past summer working on a transition to a midfoot stride, and I was wary of how my legs would hold up in the race given that I feel I still have some quad strengthening to do. One thing I found during the race is that I started to play with my stride as I was running. I would alternate from a short, compact midfoot stride to one where I focused more on extending my hip behind me a bit. I even let my foot reach out front and probably heel strike from time to time. Mixing things up as I have done while practicing form work this summer actually seemed to help as I seemed to stress my legs in different ways with each switch. I was not conscious of any form breakdown, but it’s hard to concentrate on much of anything except putting one foot in front of the other late in the race, so who knows! Never cramped or felt any type of pain or discomfort, so I guess that’s as good a sign as any that things were going well. I managed to sail through miles 13-20 very comfortably, and never was there a moment when I thought that I might hit the wall. Once again, I was shocked that it was this late in a race and I was feeling as good as I was. My splits for miles 14-20 were: 7:22, 7:12, 7:06 (fastest mile of race – mile 16), 7:16, 7:16, 7:30, 7:33. They say that the final 6 or so miles in a marathon is when the race really begins, and experience now tells me that this statement is very accurate. I knew that once I hit about mile 21 I’d be back along the ocean with a nice tailwind. The ocean would signal the beginning of the home stretch, so I focused on staying comfortable, and began to go by breathing rather than heart rate as an indicator of effort (my HR was drifting upward and didn’t seem to reflect how hard I was working since I wasn’t breathing all that hard – likely a dehydration effect combined with cardiac drift). I tried to thank any spectators who were cheering on the passing runners (just me and two other guys up ahead at that point) – I find that connecting with people along the course helps keep my thoughts from wandering to bad places. I clicked off mile 21 in 7:12, shortly after which I turned onto the ocean road and began the 4-5 mile stretch to the finish line. There’s a slight hill just after the turn, but it didn’t slow me down much, and mile 22 passed in 7:30 – I was still feeling remarkably smooth and comfortable. I recall passing an ice cream shop along the beach somewhere along the ocean road and remarking to people waiting in the parking lot something to the effect that it wasn’t fair to have an ice cream shop in that location. Mile 23 passed in 7:23 – all systems go, or so I thought. Shortly thereafter, things started to fall apart a bit. The final 5K is very flat, and you can see the finish area off in the distance by that point. That is both a blessing and a curse, as at that point in the race it might as well be 100 miles away. I calculated that I could run about 8:00 miles and still make it (not quite as it turns out – my Garmin recorded the course about 0.2 miles long, so I had less wiggle than I thought), so I slowed up a little. Mile 24 passed in 7:46 – my slowest of the race. With about 1.5 miles to go I really started to feel it. I was a bit dehydrated and glycogen depleted I think, and my mind was starting to drift into those dark places that you can’t let it enter that late in the race. “Maybe I should just stop – this is crazy!” “Wouldn’t it feel nice to just lay down here in the street?? ?” It’s amazing how quickly things can turn for the worse in a marathon, an I was starting to get worried. However, I knew the BQ was still mine if I could just hold pace, and the thought that I would have friends waiting for me at the finish was a major motivator to keep putting one foot in front of the other. Mile 25 passed in 7:45 – acceptable, but still 1.2 miles to go to a finish line that still seemed ridiculously far off in the distance. I kept telling myself that all of my training had brought me to this point. All of those runs in the blazing heat of summer. All of those night runs with the dog just to get in extra miles. All of it had brought me to this point – 1.2 miles from realizing a dream, and I wasn’t going to let it stop me. If I could just get close, I could put in a final kick and the BQ would be mine. Kick is what I did. Just a bit before the 26 mile marker I must have gotten hit by an adrenaline rush since my pace began to pick up (see pace graph above). Passing the 26 mile marker, I continued to accelerate, and I cruised into the low 7:00 range for a bit. The finish line and clock suddenly came into view, I saw that I was going to make it, and my pace dropped below 7:00 into the high 6:00 range for the final stretch. I crossed the finish line in 3:15:21 – just 38 seconds to spare (see picture below taken by my dailymile friend Jim – I remembered to stop my Garmin)! It was far closer than I had thought it would be during those final 3 miles, but I had done it! It was sheer will and a desire to get the BQ that kept me moving down that final stretch – I desperately wanted to simply stop, but I didn’t. I knew that I would never forgive myself if I did, and it’s amazing how the mind can keep the body going after it has decided that it has had enough. After crossing the finish line, a big crew was there to greet and congratulate me – honestly was one of the greatest things I have ever experienced. Runners are amazing people, and the crew from dailymile and Twitter deserves a huge amount of credit for helping me to get to the finish line and realize my dream. Thanks guys, could not have done this without you! Shortly after I finished, my friend Matt cruised through with a BQ of his own. Like me, he has tried and failed on several previous occasions, but this was his day as well and I congratulate him on the achievement! Perhaps the hardest part of the entire day was waiting for my friend Brendan to come through. Brendan needed a 3:20:59 to qualify for Boston, and he wound up crossing the line just over 30 seconds short of his goal. Brendan is one of the most supportive and dedicated runners out there, and he deserved to get his BQ – I desperately wanted to see it happen. Despite the obvious disappointment of coming up just short, he had a huge PR on the day, and his BQ is going to come soon – it’s only a matter of time. It’s hard to find words to say to someone in the moment, but I want Brendan to know that it was an honor to meet him, and that he is an inspiration to many of us – he will most definitely toe the line at Boston very soon. The post-race experience at Smuttynose was fantastic – it’s the first marathon I have run where a large group of friends had also participated (almost all of whom are runners I have met on-line through this blog, dailymile, or Twitter). We shared a celebratory Smuttynose beer, ate ice cream and pizza (my two favorite post-race foods), and waited for Alett and another friend Sandra to finish up (a few of us tried to run in with Alett, but managed to hobble only a few feet as she left us in the dust!). It’s amazing how people who have mostly never met in person can feel like old friends to one another, and the bond among runners developed by shared experience and accomplishment is an amazing thing. Perhaps more than anything else, that is what this day was about. I could have qualified for Boston at a different time in a different place, but it wouldn’t have been the same. I got to share the experience with friends, and that is something that I will never forget – I love this sport, and I love the people I have met through it. One last thing I’d like to add – four years ago I would have been hard pressed to have run a single mile all-out in under 8 minutes. On Sunday, I ran 26.2 of them at an average pace of under 7:30 min/mile. I’m by no means fast by world standards (elites would have finished an hour ahead of me! ), but relative to where I started I have come a long way, and when considering speed, the only comparison I ever make is to myself and my own past performance. I believe that when it comes to pushing our individual limits, anything is possible, and that your current level of conditioning may not be anywhere indicative of your potential. Set lofty goals, work hard to pursue them, and I guarantee you’ll surprise yourself with what you are able to accomplish. I will probably have more to say about this experience – hard to imagine given the length of this post! – but for now I’ll leave you with a few photos. 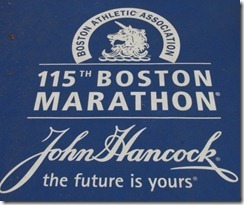 In the meantime, I’m already starting to plan for Boston 2011 – hope to see some of you there! I enjoyed that read very much. Thanks. Very best with your recovery and preparation for Boston. Pete – Congratulations! You worked so hard for the BQ and it really paid off on Sunday – you should be very proud of your achievement. Having attained my BQ earlier this year (and, like you, with only a few seconds to spare!) your race report brought back all of the excitement and emotions from that day. I had a rough day on Sunday at Hampton – fell apart in the second half of the race – so reading of your success erases my bad memories of the day. Anyways, congratulations again – hope to see you in Boston – registration is only two weeks away! p.s. Any thoughts on running Manchester this year? I’m thinking of running the half just to keep my streak alive, having run the full marathon the past 3 years. Let me know if you decide to do it. Pete – Congratulations! Your excellent post served as a fresh reminder of the hugely emotional moment in my own first BQ – similarly in my hometown with huge support from family and friends. Via a long-time internalization of one’s BQ goal, publicly shared with others in advance of the race, and experiencing the event in front of family and friends all serve as keys in enhancing the likelihood of achievement. I guarantee that your first Boston will be *just* as emotional and exciting, so good luck! What a great story from start to the amazing finish! You’re hard work really paid off and you are an inspiration. Enjoy Boston. Oh, and what is your next goal gonna be? An ultra maybe? Ha. keep pushing those limits and setting new goals! Fantastic story! Congrats on your qualifying time for Boston. You really are an inspiration for beginning runners like me….will be cheering for you in Boston in April. It was such a pleasure to be a part of your BQ quest on Sunday. Looking forward to seeing you at some of the Boston prep races in the winter (brrr) and cheering for you at Heartbreak hill this coming April. This running community, rather running family, is just amazing. goal with all of the Smuttynose crew! It is amazing how the running experience can be so nice no matter where you are. Fantastic story! I felt like being there with you. And your findings are excellent advices for those training for their first marathon. To make a dream come true is really very good. Looking forward for Boston! Pete, this is a great story! I am impressed with how far you’ve come in four years. Congrats on your BQ! The biggest question I have for you is–how did you do it?? Did you lose the weight mostly by running, or did you overhaul your diet as well? I’ve been running for four years, and neither as fast nor as far as you (I’m training for my second half marathon with a goal time of 2:15), but I haven’t had any sort of body transformation. In fact, I’ve gained 10 lbs. this year, which I’m pretty bummed about. I’m still able to keep the same running pace, but I would be happier and faster with some pounds gone. Did you change your diet at all when you started running, or did all the weight come off from exercise? Congratulations to you–you have worked so hard and deserved that BQ! with huge meals. I found that using a calorie tracking app like Lose It! makes it fairly easy to take of some extra baggage. Thanks for the reply, Pete. I don’t plan to starve myself 🙂 I’m mean when I’m hungry, and that’s not good for anyone. My two biggest downfalls are portion control and my sweet tooth. I do well at work because I plan out in advance what I’m going to eat for lunch/snack, but when I get home I want to attack the ice cream (if there’s any in the freezer). I did lose a few pounds without changing my diet during half marathon training last year (but managed to put them back on and then some…) Hopefully with my increasing mileage I can get some good results. I am just so impressed that you went from largely sedentary to BQ in a few years! A nine-minute mile still feels fast to me! by taking to large a portion at meals. Awesome race report, Pete. Big congrats to you for an amazing accomplishment! Sounds like you did everything right. Good luck with your Boston preparation, and may you stay strong & injury free! Anyways – congratulations again, a well deserved BQ! Thanks Adam – great meeting you as well. Good luck at Baystate! Congrats!!! Awesome work…can’t wait to cheer you and the rest of the crew on in April! Just found out about this. Congratulations Peter, enjoy the Boston experience! I dig the pacing as well. Great job with the PR and BQ! This is a very inspirational post for me. Gets me motivated to do some serious training and try for my own BQ! Congratulations! Congratulations! I’ve enjoyed reading about your progress over the past few months, and reading your thoughts/reflections has been really helpful in thinking about my own training. Anyway, I’m very happy you met your goal! Also, I wanted to ask- how did you break up those 5.5 miles you ran in the week before the race? 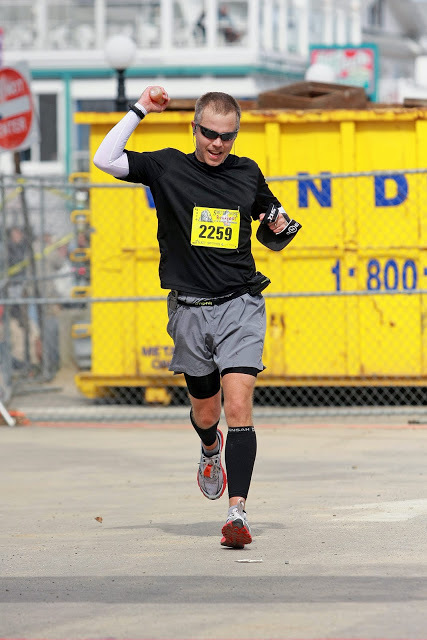 Did you feel “rusty” at all on race day (doesn’t seem like it, but figured I’d ask!)? I’m running the Chicago marathon this weekend and have been having some slight foot pain, but I haven’t yet decided the proper balance between resting and staying loose. before, I opted to go really easy, and wound up feeling great on race day. Great job, Pete! Excellent write-up as well. Looking forward to meeting you at Boston (as long as I can work out the logistics to get there). I’ve a continuing ed course that’s linked in with the marathon that weekend, so just have to work out the housing to make it affordable. Thanks Kent – hope I see you there! Pete, Great Race! And a big CONGRATULATIONS on Qualifying for Boston, I hope you get to do it every year for a very long time. I am so curious with your race strategy this time, especially the gear you wore. I hope you don’t mind me asking a few questions. 1. Injinji socks, did you add any Vaseline or lubricant on your feet before wearing them? 2. You used the calf sleeves, compression shorts and arm sleeves, does this mean you will no longer be wearing tights or long-sleeve running shirts on future marathons? 3. Why are you wearing 2 watches? and which watch did you use to monitor your mile splits? also, if you used 2 watches, how did you start both of them at the same time, seems tricky. 4. No cap at the finish line, was it too warm to wear one during the race? Sorry for all the questions, I am running a marathon in December and the weather will be in the 40s, the marathons I’m used to running are usually in the 70s to 90 degree weather… so I want to be prepared with what gear I need to use… thanks for any answers. I am still amazed with you hand-carrying your flask all throughout the race, especially with such a good finishing time. Congrats again. the Zensah sleeves. I dress differently depending on conditions. used the Timex for elapsed time. Pete, how’s the wear on the Kinvaras? I read your report first, then Matt’s. . . your stories are just amazing. Thanks so much for taking me along (virtually) for the run. It was so great to meet you all and I’m truly touched in reading your race reports that you all waited around to see me finish! I guess I should have warned you all that you’d be waiting around for a long time! Again, thanks for sharing and a BIG congratulations to you! BTW judging from your splits, you almost matched your PB on twice during the race. Between mile 5 and 11,2 and again between mile 13 and 19.2 you must have had a 10k split of around 45:09.
year as a runner. Nice to see I nearly matched it teice in the marathon! Pete, I am thoroughly impressed with your race performance at Smuttynose. I have to say I didn’t see it coming; you had seemed a bit laid back in training this summer (though I hadn’t followed THAT closely – clearly) and with the new child at home I didn’t think you’d have the energy to be able to fully prepare for and execute a BQ marathon this fall. You have a lot of natural talent as a runner, and your thoroughness in experimenting with and modifying your stride has clearly paid dividends. Congratulations, well done, and look forward to meeting you in Boston in April. Super desire and will, Peter! You’re so right about how pacing is key in the marathon. You’ve proven that at Disney and at Smuttynose. Tremendous performance! I thoroughly enjoyed your race report. I can’t wait to drink a few beers with you at the HAT! Thanks Andy! HAT then Boston right? Simply an awesome read, Pete! It amazes me that you have time to write all your blog entries. You’re an inspiration. I’m signing up for Mount Desert Island 2011 in two weeks. It’ll be my first full marathon. I just want to survive it. Based on my 1/2 marathon time from two weeks ago in Dixville (1:52), I’d finish in about 4:00 flat… I also need a 3:15:59 for Boston. Not that I have any dreams about using MDI as a BQ race! 🙂 I’ve been running for almost two years but only a “runner” since July. My speed and endurance have improved markedly since then but… Man, right now it seems impossible to run that far that quickly!! Again, congrats on the BQ! to do, so I find time for it. As you know, it’s not only about the end goal, but also about the journey. Yours is of great inspiration to others. Congratulations on reaching your goal, but most importantly on not giving up along the way! From that perspective you are already half way through your next goal, ultras! I have small kids too…and I totally understand the difficulty of balancing it all. …and please keep maintaining that post as you do…this is invaluable information. I guess this is second nature for you, being an educator! next 6 months here on the blog! Congrats on your BQ! I ran last week’s Smuttynose too, but just the Half. I set a new PR for myself which I was thrilled about and hope to bring that into next weekend when I run my next full marathon in Newport. I noticed that you’ve run Vermont City too, another great course however I ran the full in May 2010 and crashed and burned. Glad all went well for you and thanks for sharing your story. I love reading things to inspire me prior to a big run. 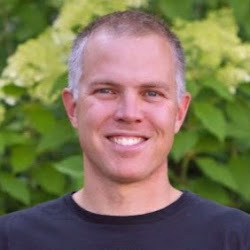 Pete, you’re an inspiration and I love the data too! I look forward to reading and re-reading your post and planning scrupulously! Well done. It’s been great following your progress. she’s an amazing runner and a great person. Congratulations on your BQ, Pete! You’re an extraordinary runner. I’ve actually been waiting until now to read this report, because I knew your description of this recent marathon would be inspiring to me as I’m preparing to run my first. Your practical approach to race strategy will undoubtedly prove helpful to me as the days before my marathon diminish. Thanks for all the work you put into this blog, Pete. It’s a tremendous resource for me. Thanks so much for your kind words, and best of luck in your marathon! Congrats! I enjoyed reading your race report. I have been following your posts (here and on DM) for about the last 6 months or so and have benefited greatly from your insight. I just finished my first marathon and wouldn’t have gotten there if it weren’t for what you have written. My time wasn’t what I had hoped for by I’ll get there the next time and maybe even BQ at some point. Please continue to provide the insight, motivation and inspiration that you do! each one, they are all amazing learning experiences. Jeez! Well deserved–hope you made it through today! I did get in – wasn’t going to miss it! I was wondering if you were able to register for Boston. Can’t believe it closed in 8 hours!